Squeaky, clean hair makes life so much easier when you are dreading. Deep cleansing your hair and ridding it of any residue build up from normal styling products is your first step. 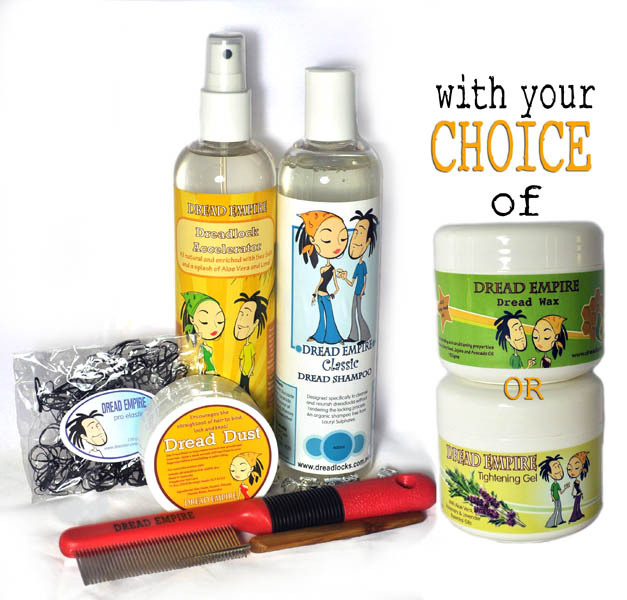 Ongoing use of dread shampoo will help dreadlocks to continue to mature, lock and knot up. The dread comb should have metal bristles so you can pull hard against the hair without the bristles snapping. The bristles should also be close together. The dreading crochet hook needs to be 0.6mm - 0.75mm in size. Alternating between back combing and crocheting will instantly give you a smooth, tight dreadlock. The pro elastics included in the Dreadlock Starter Kit are small poly bands which hold up pretty well through the initial washings. They don't pull your hair as much as regular rubber bands and they are nice and small. Use these for holding hair back while you section and dread. Pretty much any clip will do as long as they can keep the hair out of your way. There's no doubt about it, dreadlocking is a labour of love and the more help you have with accelerators the better. Accelerator and Dread Dust just make the entire process so much easier. The dreads will look better as they'll be tight and smooth and they will form faster without creating build up of product. After you have created dreads using the backcombing and crocheting technique, sealing the deal with the Tightening Gel or Wax will make them instantly neat and tidy while assisting with the kick starting of the maturing process. The Starter Kit gives you the option of selecting either the Gel or the Wax. The Gel is very popular given it's light, wash out formula and easy appliation. It has an Aloe Vera base which assists with maintaining the hairs health and thanks to the Rosemary and Lavender essential oils, it smells delish. The wax is most suited to thick, coarse hair types such as afro hair or hair which tends to be very dry. It has excellent binding ability and staying power so we recommend it is used sparingly. Last but not least... dreads are not difficult to do, just very labour intensive so try and wrangle your friend, neighbour, mother, brother or sister (it doesn't really matter who) to get in on the action! Get some movies out and make a party of it. Ok Its dreadlocks time!... First thing you should do is wash your hair with your Dread Empire shampoo. We can't stress enough that it needs to be a Residue Free Shampoo and any of the Dread Empire range will work perfectly. Regular shampoo's leave residues that condition your hair and keep it silky smooth but this will inhibit knots forming so it's no good for dreading. The deep cleansing offered by the Dread Empire range of shampoos will remove any oily build up or residues left over by previous styling products. Ideally, we recommend you start washing your hair with the Dread Empire shampoo up to a week (or 2-3 times) before you start dreading. Liberally spray Dread Empires Dreadlock Accelerator through your wet or dry hair (it doesn't matter) and allow your hair to dry completely before sectioning. The Sea Salt base of the Accelerator will open up the cuticles and create an environment in which knots thrive. We highly recommend spending a little time in the planning stages by sectioning off your hair. If you don't section it, there is a tendency to end up with some dreadlocks a lot bigger than others and spaces in between. Try to keep the size sections as uniform as possible, about the diameter of a pencil works well. The amount of hair in the section determines the size of the dread. The dreads will end up being up to twice as thick as the bundle of undreaded hair. After you do a few you'll have a pretty good feel for this. You'll be making the first dread in the back of your hair so you can make sure the size of your sections is right. Use a brick pattern (otherwise known as a subway style pattern) when creating your sections as this will stop harsh lines appearing on your head and it will also make your head of dreads appear fuller. Now for the actual dreading. Wohoo, It's finally time! Start by taking the elastic off your first section and putting it a side. Sprinkle some Dread Dust on a hard surface, press your fingers in it then run it through the section. The Dread Dust will give the comb something to grip to so it makes the backcombing process so much quicker and easier. Backcombing is kind of like teasing your hair. Hold the section firmly in one hand and push the comb through the section of hair back up to the scalp. Depending on the length of the hair, it's ok to start the stroke by puting your comb in just part way down the length of your hair. For long hair, starting the back combing from about 8cm down works well. Let only a few hairs move up at a time to ensure they are tightly packed in. Try and get the knots to start forming as close to the scalp as possible as this will help encourage new growth to dread up in the future. Pack the hairs in tighter by pressing the comb firmly against the newly formed dread on each stroke. You can turn and roll the dread as you go to make sure it comes out round. Before long your first wee dread will form... albeit a puffy, messy one. The Dreading Crochet Hook will now take your little dreadling to the next level. So you have an option here - slowly backcomb the entire section of hair, right to the end until you have nothing left then crochet OR alternate between backcombing and crocheting. Backcomb about 5cm's worth of dread, then go back over that part and crochet, back comb the next bit, then crochet and so on. The latter is what we recommend as it mixes it up a little and gives your hand muscles a break. So there's two phases to crocheting. The first involves holding the dread in one hand and using the other to rigorously push and pull the hook back and forth through the dreadlock while pointing it diagonally down and across the dread. You might pull hairs from one side then out the other and that's fine. This is the first step to consolidating that puffy section created by backcombing. Now for the second phase. This will really tidy it up finish your dreadlock off. So go back over the area you've just worked and start pushing the hook across the dread (rather than downwards). Grab a few loose hairs each time and pull them back into the middle of the dreadlock. Once the hook is back in the middle of the dread swing the handle of the hook upwards in order to release the hair within the dread. Keep repeating this and slowly rotate the dread as you go. This may sound a little confusing but don't stress too much as there are many ways to use the hook and there's no real right or wrong way. Soon enough you will discover a motion and technique that does the job and works for you. As you move down the section of the hair, you will probably need to top up the Dread Dust. Periodically, push your fingers into the Dread Dust and stroke through the undreaded hair. How you finish up the end of the dreadlock is up to you. Letting it taper off into a nice thin, wispy end is easy and will most likely be what you naturally end up with. If you want a more rounded end, with a little Dread Dust on your finger tips rubb the last few hairs between your fingers to tease them up. Now fold this last part back along the dread and use the dreading hook to weave it back into the dreadlock. Finishing off the dread with a palm roll will help condense it further and give it a nice round shape. It involves placing the top of the dread between your palms, rub your palms back and forth whilst applying downward pressure and slowly work your way down the length of the dread. Palm Rolling is also the technique used to apply Tightening Gel or Wax. If using gel, simply place a small glob of gel on your palms before palm rolling each dread. The Tightening Gel has an Aloe Vera base which is reknowned for its ability to lock and knot up hair whilst maintaining the hairs condition and health. With Rosemary and Lavender essential oils, this one also smells sooo good! The Wax has a bees wax base so, as mentioned above, it has great staying power and does an excellent job in binding and tightening the dreads. That said, 2 minutes of googling dread wax and you'll see that the use of wax is a heavily debated topic in the dread world. There are many horror stories regarding the use of the wax and in most cases, this is as a result of the over use of wax. We therfore, recommend that it is used very sparingly and it is best suited for those with coarse, curly hair types such as Afro hair or very dry hair. To apply the wax, use a blunt knife to scrape out a small ball of wax (about half the size of an M&M). Roll it between your palms to warm and soften it. Now apply to your dread using the palming rolling technique. It's a good idea to finish off by tieing a pro elastic around the base and end of each dreadlock. This will help the little dreadling form and keep its shape the first few days. Keep them on for a week or so or at least until after the first shampoo. Congratulations! You have just entered the world of dreadlocks! Now that your sporting some sweet locks, there's a couple things you need to know to keep them healthy and help them on their way to maturity. Check out or Maintenance section for more information.